Firefighters battle a blaze inside a heat treating plant in New Britain, CT, caused by a malfunctioning motor. A malfunctioning motor that caused a machine to overheat started the blaze at New Britain Heat Treating Corporation Sept. 17 that roared for hours, officials said. 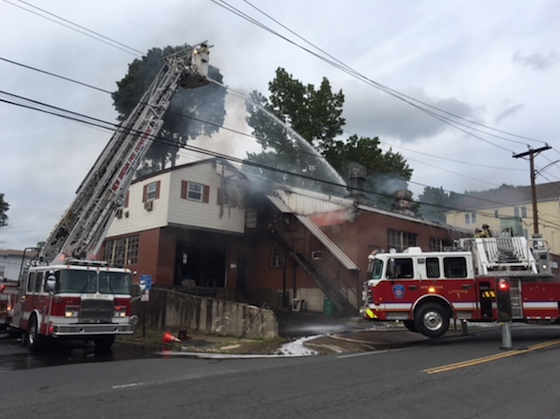 Firefighters battled the stubborn blaze at the New Britain, CT, heat treating plant as the fire continually reignited from the chemicals used in the business. After the blaze, two firefighters were sent to the hospital to be treated for exposure to chemicals, Fire Chief Raul Ortiz said. New Britain Heat Treating Corp. treats tooling and airplane parts and uses oil and propane as part of the process, Ortiz said. More than two hours after the blaze was called in, fire companies from Hartford, West Hartford and Waterbury were at the scene. Heavy fire was showing from the front of building within minutes of firefighters arriving as a column of black smoke rose over Whiting Street. The blaze was immediately upgraded to a two-alarm fire. The state Department of Energy and Environmental Protection was called in to deal with any hazardous materials, Ortiz said. Crews sprayed foam from the outside the building. The metal roof was unstable and in danger of collapse so no firefighters could get inside, Ortiz said. After battling the blaze for about an hour and a half, the flames reignited. Apartments to the east side of the building ended up evacuated. Two hours later the blaze was melting the aluminum siding on the multi-family house next door. New Britain Heat Treating Corp. has been a fixture in New Britain for decades. The building appears to be a total loss.